Reserve a Special Place in your House for this One! “Some books have a revered spot on your bookshelves. I have another spot in mind for this book, the same place where I put all books written by Kuhlken and Russell. It’s going right next to the spare roll on the shelf behind the toilet.” – Michael Connelly, bestselling author of The Lincoln Lawyer - See more at: high praise. 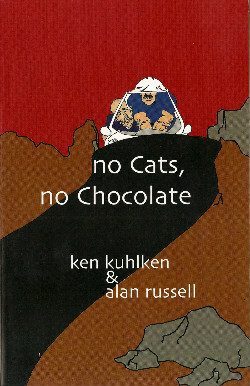 No Cats, No Chocolate, offers a wealth of belly laughs and dark humor. Give it to a fan of Hunter Thompson.